Update 2014: This Belgian waffle maker model has been replaced by the Cuisinart WAF-300 Belgian Waffle Maker with Pancake Plates. It appears to have all the great features of the model I have plus an added feature and an improvement! The new feature is the Pancake Plates. The improvement takes care of the one tiny problem I had with the original model. I mentioned it in my original review; see two paragraphs down, where I said: "The only thing they could improve is the 5-setting browning control. The sliding control is a bit wobbly, so you don't feel confident that it's really on the number you've selected." They have solved the problem! We love Belgian waffles and finally, after considering all the possibilities, got around to getting a Belgian waffle maker, the Cuisinart WAF-100 4-Slice Belgian Waffle Maker. My regular waffle maker is round, and I was gravitating toward round for the Belgian. But the Cuisinart is a large square, giving you a lot more waffle each time (four 4.5-inch squares). Since it is so large, storage could be a problem; but they've made it so that it can be stored on its back edge with the lid locked in place and the cord neatly wound and out of the way. In addition to the red and green indicator lights, it has an audible "ready" signal. So handy for those of us who get too distracted to notice the indicator lights! It looks good, is easy to use, makes great waffles, is easy to store and all that. The only thing they could improve is the 5-setting browning control. The sliding control is a bit wobbly, so you don't feel confident that it's really on the number you've selected. The Cuisinart WAF-100 4-Slice Belgian Waffle Maker takes 2 cups of batter for each 4-slice waffle. I discovered that the recipe I had developed for regular waffles works just as well for Belgian waffles. 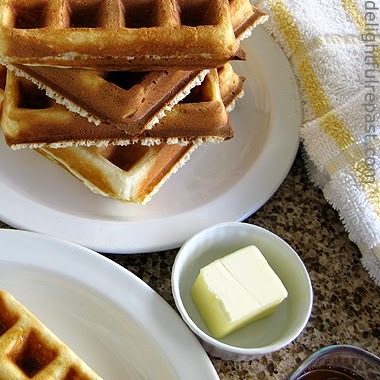 It makes either six 7-inch round regular waffles or two of these, with no leftover batter. Any leftover waffle squares can be wrapped and refrigerated for the next day or frozen for a more distant day. They reheat beautifully for a quick breakfast on a busy day. No need to ever eat a store-bought frozen waffle again. Here's the recipe for my Belgian Waffles. This is lovely. I LOVE waffles and will keep this device in mind when I am ready to purchase one. Looks delicious! You'll like it. I like using it so much, I'm going to be making waffles for dinner tonight! Come back on Friday for my recipe. Super! 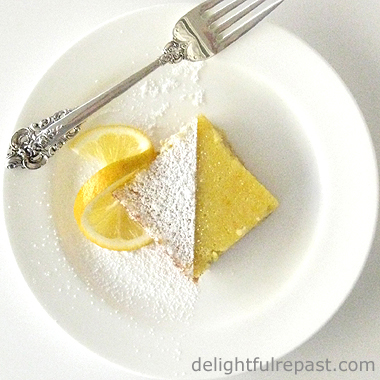 Check out the recipe I'm posting today!